It’s not at all uncommon for an artist who is already part of a successful band to start a side project. This page covered one of those fairly recently. Heck, Duran Duran’s members split up between two successful side projects at the same time in 1985. Now, some of these side projects (though probably not Duran Duran’s two) are easily forgotten. 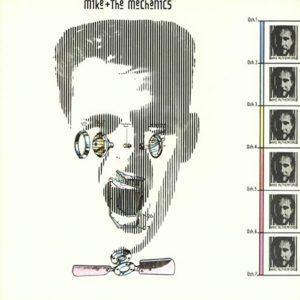 Possibly one of the most successful bands formed as a side project, though, was Mike Rutherford’s side project Mike + The Mechanics. Mike + The Mechanics was so successful that while the band, and several of its songs, are still remembered, other songs which got a fair amount of airplay originally have fallen by the wayside. One of those was the band’s 1986 top 40 hit “Taken In”. With a name like Mike + The Mechanics, one has to start with the Mike in question – in this case, Mike Rutherford. Mr. Rutherford is best known in music circles, of course, as a founding member and (originally) bass guitarist of Genesis. He took on the lead guitar role after the departure of Steve Hackett from the band in 1977, following which Genesis had a very successful run of over a decade. Even during this run of success, Genesis took breaks between albums for various reasons, one of which was to allow its members to work on solo albums. All three members of Genesis did so, with Phil Collins finding the most success. Mr. Rutherford was so happy with the band’s eponymous debut album that he decided, even before its release, that this side project would not be a one-off. Of course, the album’s eventual success appeared to prove he had chosen correctly. The first two singles from Mike + The Mechanics, “Silent Running”** and “All I Need Is A Miracle”, had very different sounds. However, both became top ten hits in early to mid-1986. Given the success of the first two releases, it was natural to release a third single. Entitled “Taken In”, it was a fairly straightforward song from Mssrs. Rutherford and Neil regarding a frustrating relationship in which trust has disappeared. Mr. Young, who had sung lead vocals on “All I Need Is A Miracle”, did the same for “Taken In”. “Taken In” entered Billboard’s Hot 100 at #85 for the week ending June 28, 1986 (chart | magazine), while “All I Need Is A Miracle” was still in the top 40. *** The single peaked at #32 just over a month later (chart | magazine) and remained fixed at that peak position for three more weeks before starting down. In all, “Taken In” spent 15 weeks on the Hot 100. 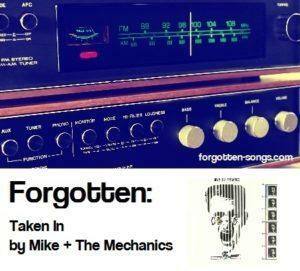 However, while Mike + The Mechanics placed two songs on the Billboard 1986 year-end chart, “Taken In” was not one of them. Being a side project, Mike + The Mechanics took a back seat in the next little while so that Genesis could record its smash album Invisible Touch. Following this, however, Genesis took yet another hiatus, and Mike + The Mechanics released what would be its most successful album, Living Years. The title track to that album would be the band’s only #1 US hit (hitting #2 in the UK). While the group continued to chart quite nicely in its native UK, it never again reached the top 40 in the US. Then the attrition started: two members left, and, unfortunately, Paul Young died in 2000 from a heart attack. Paul Carrack took a much larger role for a while before the group took an extended hiatus. However, Mike + The Mechanics is now back, without Mr. Carrack but with Andrew Roachford on vocals. The three biggest hits from Mike + The Mechanics certainly get airplay today, be it on classic hits or classic rock stations. “Taken In”, with its mellower sound and lesser chart performance, does not appear to get much, if any, spins on terrestrial radio. * Not the same Paul Young who hit #1 with “Every Time You Go Away”. Confusing, isn’t it? ** The official title was extended to “Silent Running (On Dangerous Ground)”, but virtually no one knows it by that name. *** The two songs would co-exist in the Hot 100 for another four weeks afterward, which wasn’t typical for artists in 1986.